The sequel to the hilarious There is a Monster Under My Bed Who Farts. How much trouble can one little monster cause at Christmas time? Straight from the prehistoric era comes an ex-STINK-tion story like no other! But when it's finally Mike's turn, could one tiny bowel movement end in disaster? Most families go on holiday to get away from it all. But what if a lingering smell followed you from one country to the next? Get your passports ready ... we're about to go around the world in 80 farts! Is there life on Mars? One little spaceman is determined to find out. Only no one told him that space travel can make you queasy. Can his stomach stop lurching from side to side long enough to solve the mystery? Frank has bitten off more than he can chew and now every time he opens his mouth he BURPS! The other monsters are more than happy to offer him advice. But will it work? Will Frank be cured? Or will he be belching to the end of his days? Are those clouds shaped like bottoms?! Nothing exciting has ever happened in BenDugan's backyard. That is, until something crash-lands from the biggest andsmelliest storm cloud in the sky! FART MONSTER AND ME is the hilarious newseries from bestselling duo Tim Miller and Matt Stanton - sure to get kids laughing... and reading! Stone Beach Primary is not ready for Ben Dugan and his new best friend. The teachers don't know what they're in for. The students don't know what they'll be smelling. 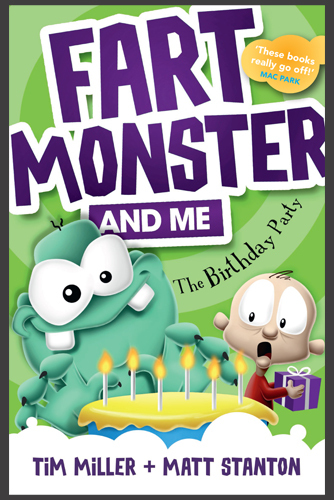 FART MONSTER AND ME is the hilarious new series from bestselling duo Tim Miller and Matt Stanton - sure to get kids laughing ... and reading! FART MONSTER AND ME is the hilarious series from bestselling duo Tim Miller and Matt Stanton - sure to get kids laughing … and reading! Ben’s class is off to visit the new space exhibit at the museum! The fart monster can’t wait to show Ben his home, Planet Let ‘er Rip, and when they find a space shuttle unattended … the opportunity is too good to pass up!